Life is full of paradoxes! 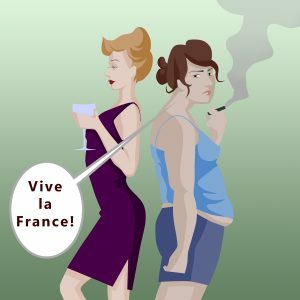 If you are even remotely interested in health and nutrition, you have probably heard of the French Paradox. It goes like this: The French eat more saturated fat than Americans, but they suffer less incidence of heart disease. This cannot be right if you believe saturated fat increases blood cholesterol and causes heart disease. In fact, some scientists tried to prove the data itself is all smoke and mirrors (false statistics). However, most searched for other things in the French diet that could negate the effect of saturated fat. Now, some of you may get really excited and think you can get your daily antioxidants and forget all about heart disease by indulging in shots and puffs at the end of a day. This is of course a pipe dream! As you see, science can be confusing! Just like life itself, it is complicated even though it sometimes looks simple on the surface. There is always something else. The hope of science is that we’ll eventually find the truth if we keep searching for it. And in the case of saturated fat and heart disease, we may do just that. Now back to the French Paradox. Could it be that saturated fat does not cause heart disease after all? Well, this is precisely what many new studies have told us.2 Although it’s welcome news to most consumers, the idea that saturated fat is not bad for our hearts may cause a heart attack in folks too committed to the opposite view! Love it or hate it, fat is an intimate part of our lives. We love fat because it makes food taste good and makes us feel contented. We hate it when it accumulates at the wrong places. We cannot live without fat because it is absolutely necessary for many basic physiological functions inside our body. But too much fat, as seen in hyperlipidemia, atherosclerosis and obesity, also harms our health. How can all these statements be true? And what do they tell us about the fat in the foods we eat? This is where science seems to get really fuzzy. Welcome to the fat world, a place full of love-hate stories! Or is it? If you put this question to lipid scientists — or “fat guys” as we may also be known — you’ll probably get a very different perspective from the one you’re used to. Over the past few decades, we have uncovered so much about how the human body metabolizes fat. Although we still have more to learn, there’s hope that we may finally put many of our nagging fat questions to rest. Chen Chen, George Loo (1995) Cigarette smoke extract inhibits oxidative modification of low density lipoprotein. Atherosclerosis 112:177-185. Russell J de Souza, Andrew Mente, Adriana Maroleanu, Adrian I Cozma, Vanessa Ha, Teruko Kishibe, Elizabeth Uleryk, Patrick Budylowski, Holger Schünemann, Joseph Beyene, Sonia S Anand (2015) Intake of saturated and trans unsaturated fatty acids and risk of all cause mortality, cardiovascular disease, and type 2 diabetes: systematic review and meta-analysis of observational studies. BMJ 351:h3978.